The Cabell County School Board has postponed a vote on a contract with FieldTurf USA to replace football and track turf at Cabell Midland High School. However, the proposed contractor has been named in numerous complaints and a proposed class action for allegedly installing a defective product. Marketed in 2005 under "Duraspine," "Prestige XM," and "Field Turf" as an exceptionally "durable" breakthrough technology, the company according to a proposed class action suit filed in U.S. District Court in New Jersey , sold 1,450 Duraspine fields to municipalities, school districts , universities, and athletic organizations. In January 2018 and April 7, 2018, Forbes and the Washington Post reported that Montgomery County Parks in Maryland and Montgomery Blair High School joined the litigation filed in New Jersey federal court. The lawsuit focuses on fields “not handling what they’re supposed to be able to handle,” Montgomery County Council member Marc Elrich (D-At Large) told the Post on April 7. FieldTurf stopped marketing the Duraspine plastic fiber in 2011 and settled a federal complaint it filed against a Chinese manufacturer for an undisclosed amount. The 2014 settlement from United States District Court for the Northern District of Georgia concluded that ultraviolet light "caused fibers to break off." Blair High School paid $1.3 million to install the turf in August 2008 and an engineering consultant recommended in 2016 that it not be used for competition. It has since been replaced. The Federal Trade Commission has declined to initiate a national investigation on the turf. 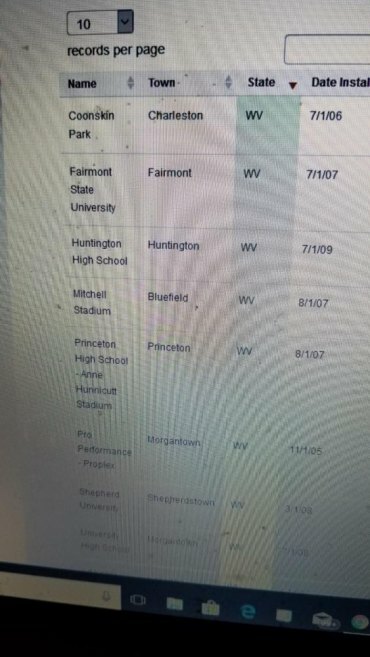 According to NJ.com eight fields were sold in West Virginia, including Huntington High School 92,126 square feet on July 1, 2009. Others were at: Coonskin Park (Charleston); Fairmont State University (Fairmont); Mitchell Stadium (Bluefield); Princeton High School (Princeton); Pro Performance Proplex (Morgantown); Shepherd University (Shepherdstown); and University High School (Morgantown). Cabell Midland's $783,842 purchase will likely be on the Cabell Board of Education agenda at its April 17 session. Funds will come from the excess levy. A copy of the filed , proposed class action suit is downloadable below.